By Jim Boyce | With 20 billion bottles per year, baijiu represents a third of global spirits sales, but is surprisingly little-known beyond its home base of China. Also, the thought of baijiu makes many people in Beijing want to barf due to too many bad experiences with ganbei sessions. World Baijiu Day aims to change all that. WBD brings together events in dozen of cities each August 9 with a theme of “beyond ganbei”. That means a focus on baiju-inspired cocktails, infusions,liqueurs, chocolate, pizza and more. Beijing’s baijiu bar is back for a fourth straight year. 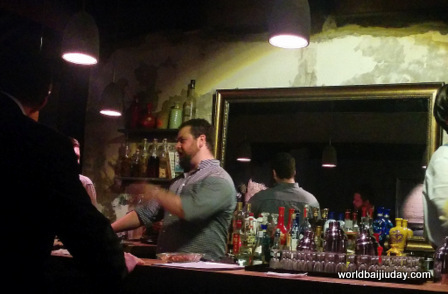 Capital Spirits hosted a baijiu and food pairing in 2015, then a quiz the next two years. The brain teasers, with a focus on baijiu appreciation and history, return for 2018. Answer correctly and you can win free shots, beers and cocktails, says owner David Putney. In the spirit of Year of the Dog, Capital Spirits is also bringing back its Hutong Hound cocktail. Glenn Schuitman has been a WBD supporter since year one. 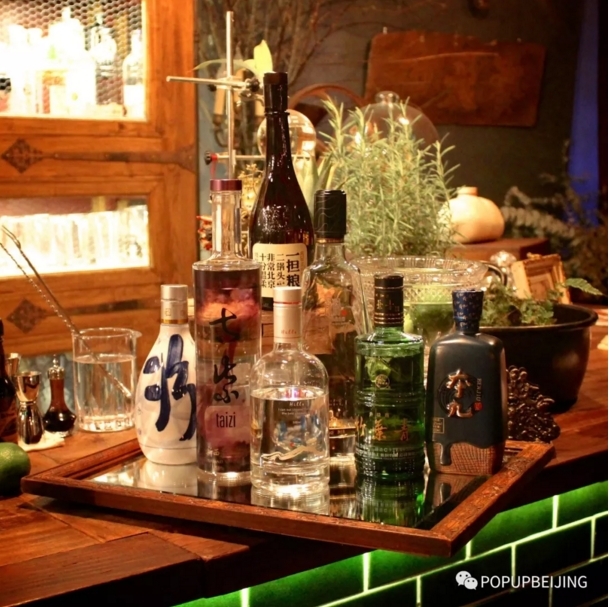 After a trio of events at Pop-Up Beijing, including global flights in 2015, bajiu tea and coffee with Good Works in 2016 and a four-course dinner with Sue Zhou Does Food in 2017, he is moving the party to Herbal, a bar that uses Chinese medicinal ingredients in its cocktails. 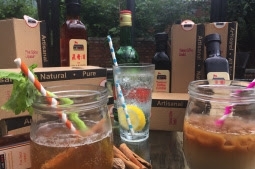 Given WBD’s date—8/9—Herbal will have a rmb89 deal (rmb120 at the door) that includes a cocktail and six baijius. Created by Herbal’s A Jian, the Chrysanthemum Terrace is a subtle refreshing cocktail with pear juice and chrysanthemum tea. 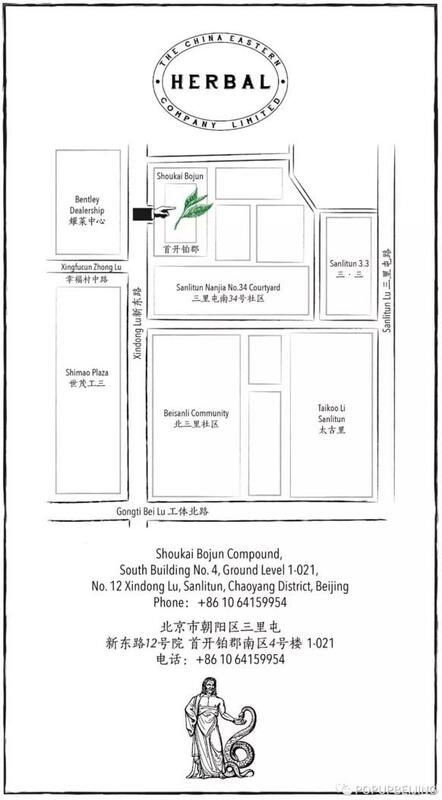 Meanwhile, the baijiu lineup will include Taizi from New Zealand, Yimuquan and Yidanliang from Hebei, Fen Chiew from Shanxi and Jiangxianghe from Anhui. Get the cocktail and six baijius for rmb89 by RSVP with this QR code (add a note with your name) or email hello (at) popupbeijing.com. Or just show up and pay rmb120. The party officially starts at 8:09 PM but earlier arrivals are welcome. After doing brews with Qu, the fermentation agent of baijiu, in 2015 and 2016, Jing-A will shift to cocktails this year. Its Back Bar will feature the Ronaldiño Hat (rmb40), with Hongxing erguotou, tripel sec, lime and Jing-A’s Guava Xanadu beer. “It’s the list of must-pack essentials for Uncle’s vacation to the tropics,” says Jing-A’s Richard Ammerman. The bar will also feature Paper Crane from baijiu bar Capital Spirits, with owner David Putney on hand to make it. That one has baijiu, Amaro Montenegro and Aperol and lemon. If that’s not enough, there will also be samples of Ming River baijiu. Long before World Baijiu Day began, Jim Spear and the team at The Schoolhouse were making baijiu liqueurs, all within view of the Great Wall. Guests enjoyed samples for WBD 2015, with cocktails added for 2016 and 2017. This year, chief mixologist and baker Randhir Singh has created three specials: the Five Spices Alive cocktail; an iced coffee with house baijiu liqueur; and a lemon meringue tart flambeed with “white lightning” aka baijiu. Check out those as well as this post with Jim Spear about the liqueurs. The Beijing “hair of the dog” for World Baijiu Day will come courtesy of Tiki from August 11 through August 2o. 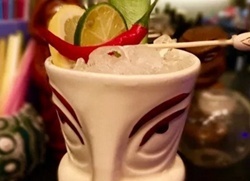 After two years of featuring the 1930s-inspired baijiu cocktail Goodbai Fu Manchu, the team at Tiki is jumping ahead a few decades. 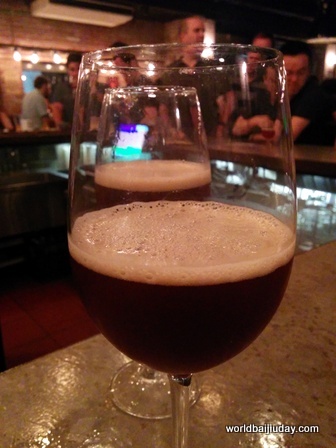 The Canton Curfew #46 is a variation of a drink from the 1960s, says co-owner Oliver Davies. This mix of Bourbon, passion fruit, lemon juice and a dash of grenadine get its baijiu influence from a float of fruity Yidanliang erguotou. Previous Article← 八位外国意见领袖的白酒告白! Eight baijiu confessions!